Sunshine, but some degrees colder than in the hot rest of Europe - the place for the world championship in knife throwing and axe throwing turned out to be wisely chosen. This may have contributed to the first world record, even before the competitions started: 158 athletes from 15 countries took part, for the first time ever more than 150. The throwers arrived alone, in small groups of regional club members, or even as national team (Russia). The goal was the same - competing in the different events, and having a good time throwing together and exchanging throwing knowledge over the course of a (long) weekend (August 1 to 4). Knife throwing and axe throwing are still also linked to the wild West, which made the location a perfect fit. 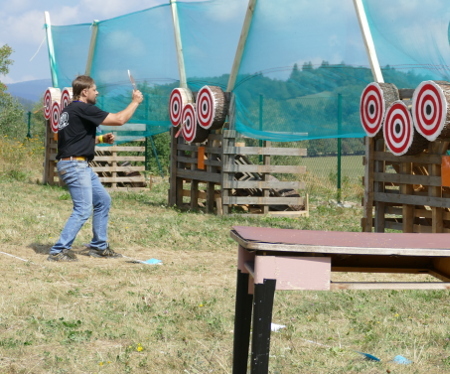 The world championship of the EuroThrowers umbrella organisation was held in Camp Indiana in Rýmařov in the Czech Republic. Situated below a mountain cliff sits a wild West village, built and maintained by local volunteers. Besides saloon and hotel, the village boasts a fort with impressive palisade, offering an amphitheatre inside. Gin Šín, the chief organiser from the local club WAC, had made sure to provide a supporting program to make the theme of wild West become reality: An Indiana Jones inspired performance in the fort, sales booths, lasso and whip shows and competitions, and oriental belly dance. The last seems to be a fixture in the cultural program of Czechia - the same goes for Kofola, the well-liked local variant of Cola, which was always available on tap (besides beer, of course). Catering was well provided for. The starting fee included lunch vouchers for typical meals in a nearby restaurant, and snack booths provided food ranging from steaks to langos. Most participants stayed in one of the very reasonably priced hotels of the surrounding Moravian ski area. Some 15 tents were also set up in the shaded camping area directly on site. Relaxing in your hammock, you could watch all participants wandering by: The whole area was divided by the cliff, with competition targets and (closer spaced) training areas both on the upper and lower area. The connecting pathway led up stairs and a steep climb, by day three definitely having increased the fitness of all present. Besides the standard events testing precision and long distance sticking abilities, experimental events were thrown. In "speed throwing", the goal was to stick most knives in the target in 20 seconds, while in "silhouette", you had to outline two circles. (Find the complete rules below.) For the first time, silhouette was offered for knives and axes, which proved very popular. Also a novelty was the time qualification round employed in the duel cup, considerably speeding up this event. Hint: If you want to qualify for the one-on-one duels, your time to draw the knife after the signal and stick it into the target needs to be below 1100 milliseconds! As usual, no-spin throwing was possible even in standard events. Through the instigation of Adam Celadin, for this the organiser this year even awarded special "Grand Indiana Award" no spin prices. Sadly this opportunity was accepted by less than ten participants. The best established no spin event remains the challenging walkback, with participation rising sharply to 53 athletes (up from 35 in 2017). For the first time ever the walkback-winner was officially awarded the title of "World Champion in No Spin Knife Throwing" (congratulations to Joel Holopainen from Finland). My personal favourite was the adventure course event devised and built by Dušan Dvořák: Running past six groups of targets, you had to jump over palettes, stick knives from different distances, roll under a table, pick up your axe for a half-spin - the course was challenging. There were bonus points for those who completed it faster than the average thrower. With the temperatures still rather elevated, many events were moved to the evening hours (which also suited the organisers). They were followed by entertaining events such as an aesthetically pleasing fire show, live music, and chats long into the night, with throwers congregating in the welcoming area around the saloon. As usual, those participants and supporters who could translate between the various languages were in high demand. Highlight was the award ceremony in the amphitheatre of the fort: Participants and spectators enjoyed a 90-minute wild West show. It was moderated by the same emcee that tirelessly explained the championship's events to Czech visitors during the weekend. Glove puppet "Ginger" managed to sneak backstage to give a sideshow. With the long distance events closing only at dawn, logistics got a little tight behind the scenes. But then on stage, more winners than ever received their medals, certificates and thrower statuettes - those were modelled to the likeliness of famous Czech throwers such as Pepe Smékal. A Big Thank You for holding the world championship goes to Gin of the WAC and his helpers, among others Martin Heczko and Milan Fogaš (junior and senior), and to all those who, like Dušan Dvořák of the W-Club, invested precious vacation days to come early and help with the setup. I am sure that throwing together in the unique Czech wild West atmosphere of Camp Indiana in hospitable Rýmařov is a memory that will be treasured by all participants! Results of the World Championship 2018 - download the ZIP archive with spreadsheet files for each of the competition days. If there was a tie for one of the first three places of an event, those throwers were rated higher that had a higher number of sticks in the bulls eye/5 points (as indicated by "5"; if the numbers were the same for all scoring zones going down, additional tie breakers were made.). In some events, there was a separate final "f", with the points added to the main round. You will notice that in some cases, score sheets were not collected to resolve ties. EuroThrowers and the organisers sincerely apologise for the resulting ranking ambiguity! The base rules employed were the Standard European Knife and Axe throwing rules (2010 version). The three countries with the best throwers will be recognised (there are separate rankings for men and women). The country rankings will be based on the normalised cumulative precision scores of the top throwers of each country (men: 5 best throwers; women: 4 best throwers). The score is thus based on the results of the six knife and axe precision events. Countries with less than 5/4 participants who have thrown the full six precision events will not be included in the respective ranking. For the title of World Champion in Knife/Axe Precision Throwing , we will use the walk-back-mode. You throw your knife from the handle, with no spin, in walk-back mode. Knife throwing into targets that are grouped around a silhouette. Hits inside the silhouette will cost you a penalty of minus 10 points. Distance minimum 3m. Throwing your axe into target-circles that are grouped around two big circles (the silhouette). Hits inside the silhouette will cost you a penalty of minus 10 points. Minimum distance 4m. This is the traditional Czech walkback since nearly 20 years. It consists of one round of classic walk back, but with distances from 3-11 meters for knives (4-11 meters for axes), a zone to be in with both feet is 1m. You need stick at least one of your three tools everytime or you are out, if you stick you can move back to next zone. Several targets on an obstacle course with a length of roughly 70m. Minimum distances: 2m to 5m. The thrower can freely choose the throwing technique. It is the goal to stick three knives and three axes as fast as possible into the targets. Points and course time decide about the winners. Under the label Grand Indiana, the Czech organiser proposed some additional events. This included special rankings for participants throwing no-spin in the standard events. The Grand Prix requires to demonstrate a wide field of skills in whip handling, ranging from precision hits to a Zorro contest. Bring your own whip! You have 10 minutes to stage a western show - any combination of lasso, whip, knife, ax, revolver, bow and dance. Alone, with a partner, or even engaging the audience. Judges will select the best one, based on style and technique, costume, music, contact with viewers, and the quality of the performance.